Birds embody freedom and connect us across cultures. 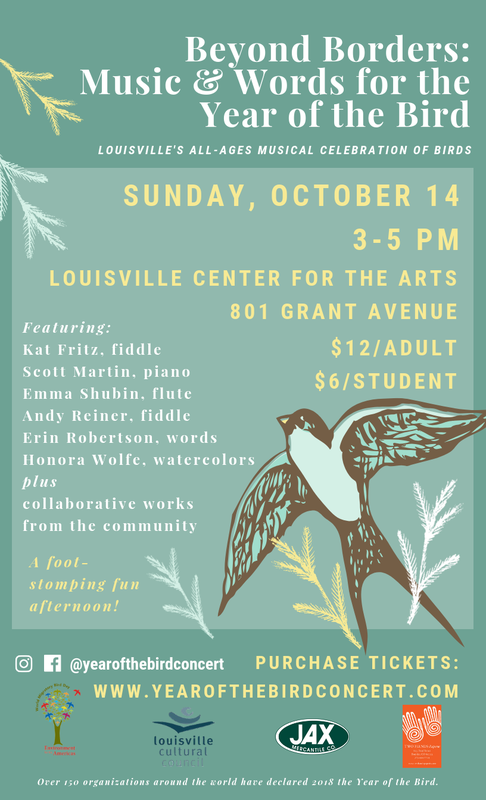 Join Louisville musicians, writers, and artists in celebrating the joy of migratory birds as we play and say what birds mean to us. Attend the Beyond Borders: Music & Words for the Year of the Bird concert (Sunday, October 14th, 3-5pm, Louisville Center for the Arts, 801 Grant Avenue). You're bound to see and hear your human and feathered neighbors in a new way. Purchase tickets now! Local musicians, poets, and artists join together to celebrate community and the beauty of migratory birds in Colorado and around the world. At this all-ages, family-friendly performance, we will weave together a colorful tapestry of music offerings from the Jazz, Classical, and Folk traditions and words in the form of poetry and prose. Beautiful Colorado bird-themed watercolors and photography will also be featured. Artists include Kat Fritz, Scott Martin, Emma Shubin, Andy Reiner, Erin Robertson, Laurie Amodeo, Honora Wolfe, and others from the community. Did you know that over 180 organizations around the world have declared 2018 the Year of the Bird in honor of the 100th anniversary of the signing of the Migratory Bird Treaty Act? Proceeds from the sales of original watercolors will be donated to the fight to preserve this important treaty. Come celebrate how birds connect us across cultures!